Thank you, thank you, thank you!! 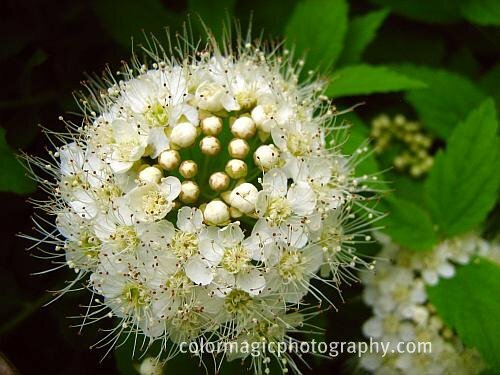 Spirea -- just shot a bunch and have not uploaded them to my computer. After seeing your wonderful shots, I'm not sure I want to -- lol. Anyway, beautifully done-- they are quite remarkable. what´s wrong with the backlink? It is working perfectly. there was nothing wrong with the backlink! You removed my entry. Goodby! Yes Footstep, this week was better than last week. At least you linked to a post page but you are right, it was working. The spirea is just so sweet and lovely. What fantastic details. Beautiful post. I love the ant in the second photo! It gives perspective to the flowers! They are so tiny!!! 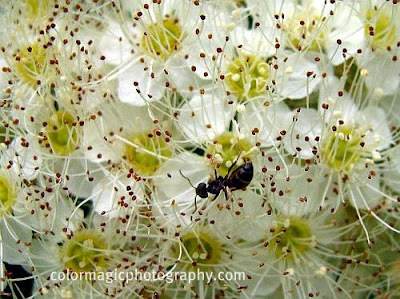 A beautiful spirea Maia and your macros are fabulous. It dose seem a lot hairier than the ones I've seen. Maybe someone will know the name. you remove a perfectly working link?? It is obvious you don´t want participants. I always set the link to the actual post in question. If I want to go back I find the post emediately and don´t have to look for it among 20 posts labeled "macro". Well, you lost me for one. Dear Maia...your photos inspire me. Am going to get serious about macros. I got that the first time N.Footstep. Yes I know that you always do that, you and a few others that are more special than the rest of participants. I especially asked you not to do it in the note at the end of the post. there is a "Link to this post" option at the end of each post in the original Blogger template which can be disabled from the blog settings. Mine is deleted even from the template, that should tell you something. There is a very good SEO reason for doing this but I don't expect you to understand it. Often there are even standalone image URL-s entered in the list, instead of blog entries. Bottom line, I welcome each participant, better said, friends, under my terms, not by quantity. Nobody is forced to participate. I love how are you flowers give off light with such delicacy and beauty. 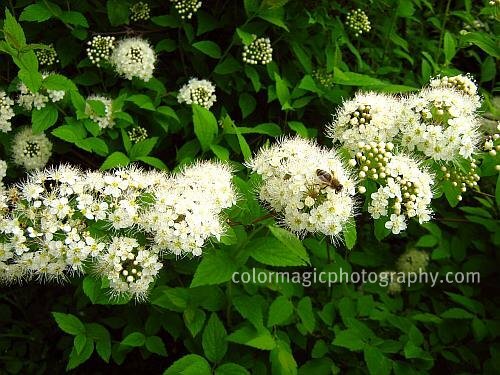 I'm not sure what the exact name is of this spirea -- but I believe it is an older variety. So pretty! That was one gorgeous bloom! Inspite the heat and hectic week I made it to MFT this week! I hope my link is OK? It looks like an onion flower. Thank you Stan, I checked and your wife is right. Thank you Mrs. Stan. You still have to link back to this blog, this is how things work with all memes. Lindas flores em ótimas fotos!